Papiss Demba Cisse all but cemented his status as Premier League signing of the season with two spectacular goals that gave Newcastle a crucial 2-0 win over Chelsea. The first goal came off a beautiful cross by Davide Santon, that Cisse controlled with one touch and volleyed into the net with his left foot. His second came in the ten minutes of stoppage time at the end of the match when he struck what could be the goal of the season. Cisse was over 30 yards from goal when he struck with the outside of his right foot and sent a majestic curling shot over the outstretched hands of Peter Cech into the goal. It was a top quality goal from a striker who has wasted no time making his mark on the Premier League. After beginning his career with Douanes, Dakar in his home country of Senegal, Papiss Cisse was transferred to French club FC Metz in 2005. After playing a single match for the club in Ligue 1, he was loaned out to French third division side AS Cherbourg. He contributed significantly during his loan spell with 11 goals in 28 league appearances and immediately was slotted back into the FC Metz squad during their Ligue 2 winning campaign, earning 12 goals in 35 matches. FC Metz faced considerable difficulty in Ligue 1 and Cisse was loaned to Third Division LB Chateauroux after going scoreless in 9 Ligue 1 matches for Metz. He rejoined Metz the following season when the club was relegated to Ligue 2 where he added 24 goals in 54 matches over the next two seasons. After a fantastic start to his 2009-10 campaign with Metz, Cisse caught the attention of the German club SC Freiburg when he scored a goal and an assist in a match between Freiburg and Metz. After failing to agree on a transfer fee during the summer window, the clubs reached an agreement shortly before the winter transfer window opened and Cisse was transferred for a fee of €1.6 million. 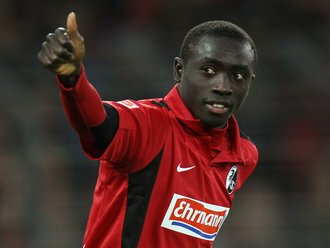 Cisse was quick off the mark for Freiburg, scoring 6 goals in 16 matches to finish their 2009-10 campaign. The following season is when Cisse truly announced his arrival in the Bundesliga. Cisse massively improved in his first full season with the club by scoring 22 goals in 32 league appearances. He finished the season with the second most goals in the Bundesliga and broke Tony Yeboah’s record for goals scored by an African player in the Bundesliga. Cisse also earned the EFFIFU award for most efficient striker in Europe. Cisse’s form carried over into the current season which he began with Freiburg adding 9 goals in his first 17 matches. Cisse’s considerable skill and impressive goal scoring rate attracted the attention of larger clubs and on January 17, 2012 Newcastle announced Cisse would be joining fellow Senegalese striker Demba Ba at St. James Park. A fee in the area of £10 million was negotiated between the clubs and after being given the number 9 jersey for Newcastle, Cisse made his debut just over two weeks later on February 5 against Aston Villa. After entering the game for the injured Leon Best, Cisse immediately endeared himself to St. James Park by scoring the winning goal in the 71st minute. Cisse’s adept positioning and precise finishing touch continued in the following string of games and on March 25, his brace against West Brom made him the fastest player in Newcastle history to reach 5 goals. His stunning form continued by adding a brace in the following two matches against Liverpool and Swansea City, as he led the way for Newcastle’s charge up the Premier League table. He added several more over the next few weeks before his brace yesterday against Chelsea, and as it currently stands he is the most efficient goal scorer in the history of Newcastle United. In their second season back in the Barclay’s Premier League, Newcastle United is now in position to qualify for the UEFA Champions League. The Alan Pardew led squad has been bolstered by the emergence of Hatem Ben Arfa, Demba Ba, and the stalwart leadership of Fabricio Coloccini and Jonas Gutierrez. Tim Krul has been a revelation in goal for the Magpies, earning 15 clean sheets so far this season. Overall, this Newcastle squad looks to be a drastically improved squad from a year ago and they will see European football in some form regardless of how the final two fixtures shape up. Newcastle’s form relies heavily on Papiss Cisse and he signaled his arrival as a real Premier League star with his incredible performance yesterday. After playing what he called “the game of my life”, Newcastle now has their sights on 3rd place Arsenal and look to play spoilers to Manchester City’s title dreams. It has been a fantastic campaign for Newcastle and their fans, we will see over the next two weeks if they can end it with a fitting finish.